Bring a large pot of salted water to a boil, and cook the pasta according to package directions for al dente. Remove with a slotted spoon, and reserve in a bowl. Do not drain the pasta water. Bring the water back up to a boil and cook the broccoli, carrots, and bell pepper slices until they are bright and tender crisp, 2 minutes. Drain the vegetables and set aside. Heat a large skillet over medium heat and add the oil, onions, and garlic. Cook until the onions are soft, 4-6 minutes. Add the zucchini, yellow squash, and tomatoes and continue cooking until they begin to soften, 2-4 minutes. Adjust the heat to medium-high and add the peas, the set-aside vegetables, the cooking wine, lemon juice, and lemon zest and simmer until the sauce slightly thickens, 3-4 minutes. 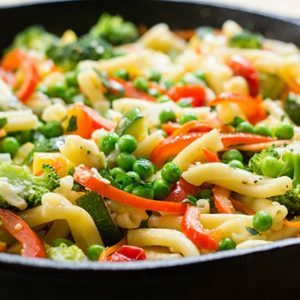 Reduce the heat to low and add the set-aside cooked pasta, the cheese, and parsley to the skillet. Toss gently with tongs to evenly coat all the ingredients in the sauce, and serve hot.